This program was jointly organized by Peace Winds America (NPO) and the City of Seattle, and was held from 15-17 October at the Seattle Office of Emergency Management. The program aimed to promote the sharing of experiences and ideas regarding natural disasters and emergency management between local government officials in the US and Japan. The Asian Disaster Reduction Center (ADRC), at the request of the organizers, provided help with the coordination of the participating organizations from Japan. Also, ADRC gave a presentation on "Government Coordination" in Japan and facilitated discussions throughout the program. 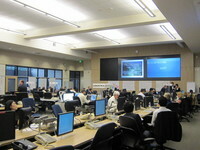 The participants included Japanese officials from the Ministry of Defense, Osaka Prefecture and the City of Osaka, Hyogo Prefecture and the City of Kobe, and Hiroshima Prefecture and the City of Hiroshima, as well as American representatives from the Federal Emergency Management Agency (FEMA), the City of Seattle, King County, the City of Honolulu, Microsoft, Boeing, and other organizations. The participants gave presentations on their own experiences and the outlook for the future from the viewpoint of those who are doing practical disaster management work on the ground. The Japanese participants were particularly impressed with the collaborative frameworks that have been developed in the US to enable local governments, private companies, and NGOs to work together. This exchange program is expected to become an annual event and thus is expected to prove highly useful to both US and Japanese local governments long into the future.